Dr. Green is a St. Baldrick’s Scholar at the University of Colorado. He explains DIPG symptoms, treatment, and how research is helping kids with this type of childhood cancer. DIPG stands for diffuse intrinsic pontine glioma. It is a type of high-grade glioma, a brain tumor that comes from cells called glia that surround, protect, and otherwise support the nerve cells in the brain. DIPG is always found in the brainstem. This part of the brain controls many basic functions like breathing and swallowing, as well as muscles that help with speech and eye movements. It is most common in elementary school-aged children, but it can affect children of any age. About 250 kids in the U.S. are diagnosed with DIPG each year. 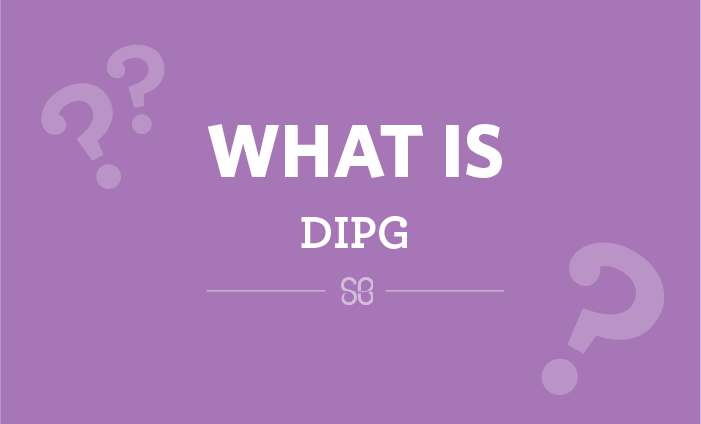 What are the signs and symptoms of DIPG? DIPG tends to grow quickly, so most patients are diagnosed within three months of when their symptoms start. It’s important to know, though, that there are much more common reasons for all these symptoms than DIPG. DIPG is diagnosed primarily with an MRI. DIPG can sometimes be diagnosed with an MRI alone. Other times, a neurosurgeon will biopsy the tumor by removing a piece of it to study under a microscope. As we learn more about DIPG, more patients are having biopsies done. Biopsies help researchers learn about DIPG in general, and they can help us determine what medicines might help treat that individual child’s tumor. What treatment options are available for patients with DIPG? Unfortunately, treatment options for DIPG are currently very limited. The tumors can’t be removed surgically because the tumor cells are all intermixed with the normal cells in the brainstem that are so crucial for functions like breathing. Radiation to the tumor is the only therapy that has been proven to shrink these tumors and let kids with DIPG live longer, but even radiation cannot make the tumor go away permanently. Researchers have tried many chemotherapies for DIPG, but so far, none of them has worked. The lack of treatment options and the fact that almost all DIPG patients die within two years of diagnosis make DIPG research a very important and immediate need. How is research helping kids with DIPG? Historically, one of the barriers to DIPG research has been a lack of tumor tissue. But with more and more patients undergoing biopsies, and with courageous families donating their children’s tumors to research after their death, researchers have been able to make some encouraging discoveries in the past several years. We’ve learned a lot about the genetic changes associated with DIPG, which can serve as targets for new therapies. We’ve also seen some success with new medicines in laboratory models of DIPG, and we’re finding more effective methods to deliver those medicines to the tumor. These new strategies have started to be used in clinical trials. We are optimistic about having more effective treatments within the next couple of years. Together we can take childhood back from cancer. Give today. Join the thousands of men, women, and children rocking the bald and raising money for kids’ cancer research. Sign up to be a shavee℠ today. Not ready to shave? No problem! You can start an event, volunteer, or create your own fundraiser — whatever your talents, there’s a place for you in the fight against childhood cancer.